If you’ve enjoyed the rugby at Sydney Football Stadium or the races at Royal Randwick, chances are the man at grassroots level who has made it all possible is Peter McMaugh. The agricultural scientist, 83, is Sydney’s turf warrior and has been made a Member in the General Division in the Order of Australia for his work spanning 55 years of green-thumbed grass-breeding and development. He has not only bred a variety of couch grasses that grace the lawns of the Melbourne Cricket Ground, Fox Studios, Royal Randwick, Sydney’s Botanic Gardens and polo fields at the late Kerry Packer’s property, but has also become the foundation of Australia’s turf production industry. Mr McMaugh was also involved in turfing major sporting venue the Sydney Football Stadium. “I love grass. I’ve made it my profession. It’s my life — working with something you love is like getting two stiff gins into you,” he said. Mr McMaugh’s Windsor Green couch grass has for 20 years graced the Royal Botanic Garden’s rose garden, which is visited by millions each year. “One of the many achievements of Peter McMaugh was the development of Windsor Green couch, which we use at the Royal Botanic Garden Sydney in our Rose Garden,” Acting Curator-Manager David Laughlin said. Mr McMaugh admits that when he visits the fields and facilities of NSW that showcase his grass, he can’t help but check for parched lawns and forlorn grass. 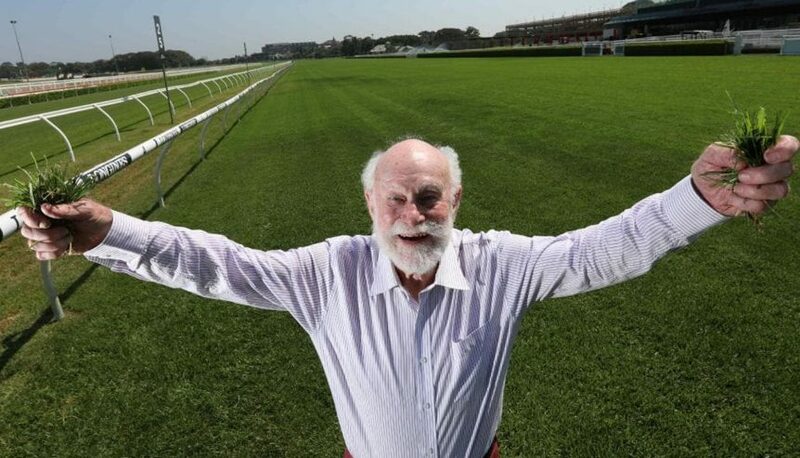 Royal Randwick Racecourse two years ago solicited the help of the grandfather-of-four to help design and turf its second Kensington track with kikuyu. Varieties of grass take at least eight years to breed in the myriad of plant pots in McMaugh’s back yard at his home in Carlingford. The first variety in his collection of fine blade grasses was released in 1983, providing the Australian industry with superior varieties Winter Green and Windsor Green, from which other plant breeders have developed new superior couch grass. Among his many achievements have been creating the name for Australia’s most recognised buffalo grass, Sir Walter, and developing the notion of a drop-in wicket in the early days of one-day cricket. “I gave the idea to Richie Benaud over lunch one day,” he said. “There’s room for improvement on the pitches of the MCG and SCG — the bounce of the ball tells you that. If I’m invited I’ll lend them my expertise,” he said. Mr McMaugh established the country’s first turf research organisation, Australia Turf Research Institute, in 1964, but he is reluctant to accept a nod for his scientific expertise, innovation and commercial accomplishments. “I’m quite stunned that I’ve been honoured. I’m a background person,” he said. “I shun the limelight but grass, well, it needs a higher profile. It’s a very important part of the city’s environment. It provides an oasis of clean air, oxygen — life without any green is a very deprived one,” he said.